Robert Vitalis's empirically rich study challenges the left-nationalist paradigm through which twentieth-century Egyptian history and politics has generally been interpreted. He argues with those who explain Egyptian economic development primarily in terms of class and of power struggles between British and Egyptian entrepreneurs and politicians. 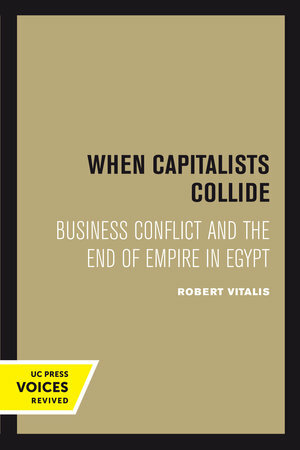 Vitalis offers a rare, detailed view of the objectives and political strategies of both international firms and Egypt's own big business rivals. He highlights the career of Muhammad Ahmad 'Abbud, modern Egypt's most successful businessman. Vitalis's argument can be effectively applied to many other developing countries and his book makes a major contribution to ongoing debates regarding class, underdevelopment, and nationalism. This title is part of UC Press's Voices Revived program, which commemorates University of California Press’s mission to seek out and cultivate the brightest minds and give them voice, reach, and impact. Drawing on a backlist dating to 1893, Voices Revived makes high-quality, peer-reviewed scholarship accessible once again using print-on-demand technology. This title was originally published in 1995. Robert Vitalis is Professor of Comparative and International Relations in the Political Science Department at the University of Pennsylvania.